A rich, three layer, almond treat! This little bite of cake is one DD#2’s favorite Christmas goodies. There are five pieces on this tray. Can you find them? Don’t let this recipe throw you off. They are actually easy to make, beautiful to look at, and delicious! 2. 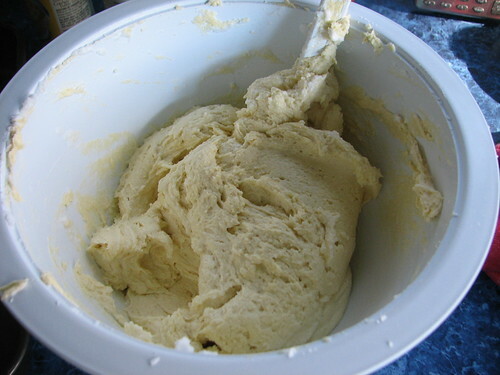 Break up almond paste in large bowl. Add butter, sugar, egg yolks and almond extract. Beat with electric mixer until light and fluffy, 5 minutes. 3.Beat in flour and salt. 4. 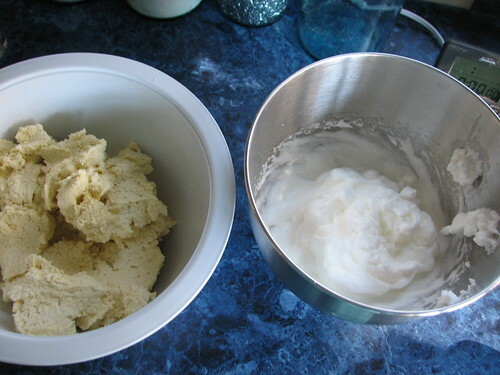 In separate bowl with clean beaters, beat egg whites with electric mixer until stiff peaks form. Fold into almond mixture until well blended. 5. Divide mixture into three equal portions. 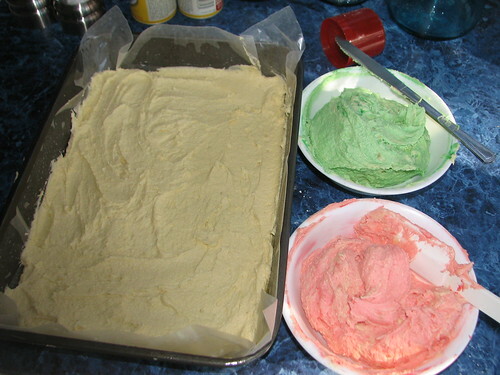 Add green food coloring to one portion and red food coloring to another, leaving the last portion yellow. 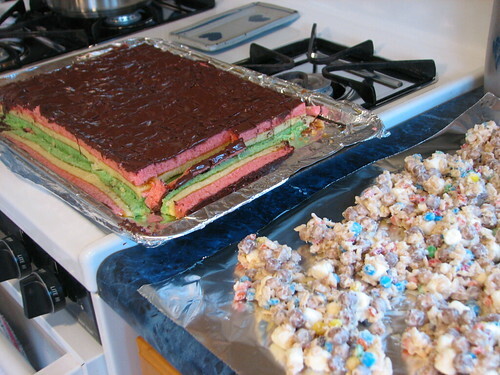 Separately spread each colored portion into prepared pans. 6. Bake in preheated 350 oven 15 minutes or until edges are golden brown. Immediately remove the cakes from the pans, using the waxed paper overhang. 7. Heat apricot jelly in a small saucepan. 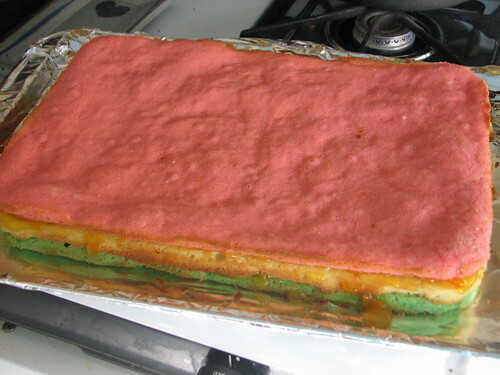 Place the green cake layer on a jelly-roll pan. Spread half of warm jelly over this layer to the edges; slide the yellow layer on top; spread with remaining apricot jelly; slide the pink layer, right side up, onto the yellow layer. 8. Cover with plastic wrap; weigh down with large wooden cutting board or heavy plate. Place in refrigerator overnight or up to three days. It freezes well. I cover it with a few layers of plastic wrap, then wrap it in foil for the freezer (after weighting it overnight in the refrigerator). 9. Melt chocolate in double boiler over hot water. Spread melted chocolate to edges of cake. Let dry 10 minutes or until hardened. Trim edges off cake. Cut into 1″ squares. I score the chocolate while it is still soft so it is easier to cut after the topping has hardened. This entry was written by ~~Rhonda, posted on December 21, 2007 at 5:01 pm, filed under Christmas, cookies, Recipes and tagged Christmas, cookies, holiday petits fours, open house, recipe. Bookmark the permalink. Follow any comments here with the RSS feed for this post. Post a comment or leave a trackback: Trackback URL. born and raised in Okawville but now live in Northern Virginia. I still like to keep up with things there as a son still lives in Okawville. My wife also likes Christmas. She has 8 trees, and our dining room table is filled with a minature Christmas village. She too makes cookes. We kept count this year. 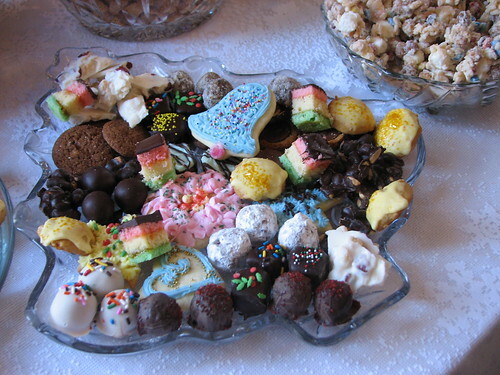 She made 13 different kinds, for a total of 2,850 cookies. Will have cookies for a long time. 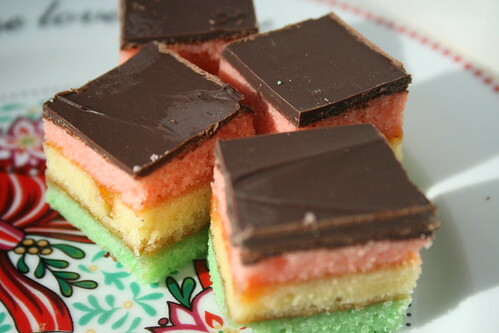 I think I may make these.They will look great on a cook tray. I also have a question,I was wondering if I put cookies in an airtight container how long will they last at room temp?I dont have a big enough freezer to store all the cookies I want to make. Hillary, the recipe for these cookies, given at epicurious.com, says they keep, layered between sheets of wax paper or parchment, in an airtight container at room temperature for two weeks. I’ve never stored them that way. If not frozen, I’d store them in the fridge. If I left them out, they’d never last two weeks! 🙂 They are too good to resist. isn’t it funny how the kids’ have different favorites.